Students of Resonance Commerce & Law Program Division (CLPD) excelled in Rajasthan Board (XII-Commerce) result declared on 15 May, 2017. 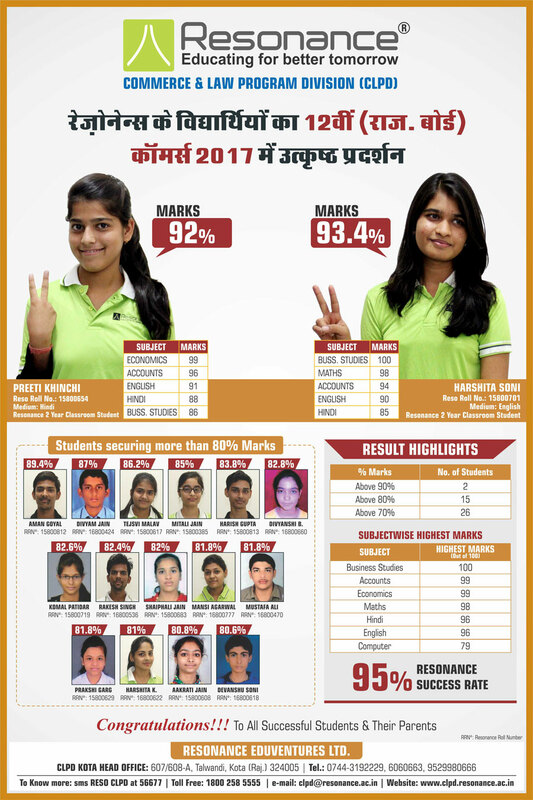 Total 94 Students of the Institute came out with flying Colours in the Result, which also includes 2 Students who secured more than 90% Marks. RESONite, Harshita Soni, topped Institute with 93.4% Marks & Preeti Khinchi secured 92% Marks. Harshita Soni Secured 100 Out of 100 In Business studies and Preeti Khinchi Secured 99 Out of 100 in Economics. Harish Gupta secured 99 Marks in Accountancy & Harshita Soni Secured 98 out of 100 in Maths. Heartiest Congratulations to all the Successful Students.